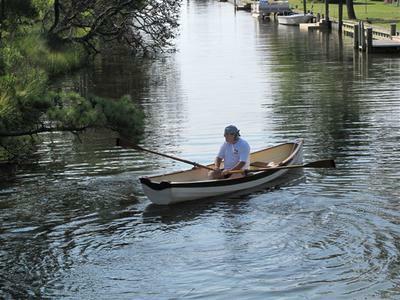 RKL Boatworks 14' rowboat fiberglass model. origanal owner bought it in 1989 - I am the 2nd owner. It is in excellent condition and has been kept indoors for last couple of years. It is on a 1990 Loadrite galvanized trailer. Also has a removable sliding sculling seat with 2 wooden sculls. Also 2 sets of Shaw and Tenney 6.5" curved oars -- one set brand new. As an option I have a 2.5HP Mercury outboard that I can sell with it. Are you selling the RKL Rangley?